1 A None No Power Seat 1 A is a Business Class Bulkhead seat. There is no floor storage for this seat during takeoff and landing. The tray table is in the armrest, making the armrests immovable and slightly reducing seat width. 1 C None No Power Seat 1 C is a Business Class Bulkhead seat, however, the close proximity to the lavatories may be bothersome. There is no floor storage for this seat during takeoff and landing. The tray table is in the armrest, making the armrests immovable and slightly reducing seat width. 1 D None No Power Seat 1 D is a Business Class Bulkhead seat, however, the close proximity to the lavatories may be bothersome. There is no floor storage for this seat during takeoff and landing. The tray table is in the armrest, making the armrests immovable and slightly reducing seat width. 1 K None No Power Seat 1 K is a Business Class Bulkhead seat. There is no floor storage for this seat during takeoff and landing. The tray table is in the armrest, making the armrests immovable and slightly reducing seat width. 11 K None No Power Seat 11 K is an Economy Class seat that may have limited recline due to the Exit Row behind. 12 A None No Power Seat 12 A is an Economy Class Exit Row seat that has extra legroom. There is no floor storage for this seat during takeoff and landing. The tray table is in the armrest, making the armrest immovable and slightly reducing seat width. 12 B None No Power Seat 12 B is an Economy Class Exit Row seat that has extra legroom. There is no floor storage for this seat during takeoff and landing. The tray table is in the armrest, making the armrest immovable and slightly reducing seat width. 12 C None No Power Seat 12 C is an Economy Class Exit Row seat that has extra legroom. There is no floor storage for this seat during takeoff and landing. The tray table is in the armrest, making the armrest immovable and slightly reducing seat width. 12 D None No Power Seat 12 D is an Economy Class Exit Row seat that has extra legroom. There is no floor storage for this seat during takeoff and landing. The tray table is in the armrest, making the armrest immovable and slightly reducing seat width. 12 E None No Power Seat 12 E is an Economy Class Exit Row seat that has extra legroom. There is no floor storage for this seat during takeoff and landing. The tray table is in the armrest, making the armrest immovable and slightly reducing seat width. 12 K None No Power Seat 12 K is an Economy Class Exit Row seat that has extra legroom. There is no floor storage for this seat during takeoff and landing. The tray table is in the armrest, making the armrest immovable and slightly reducing seat width. 24 C None No Power Seat 24 C is a standard Economy Class seat, however, the close proximity to the lavatories may be bothersome. 24 D None No Power Seat 24 D is a standard Economy Class seat, however, the close proximity to the lavatories may be bothersome. 25 A None No Power Seat 25 A is an Economy Class seat in the last row of the plane and may have limited recline. The close proximity to the lavatories behind may be bothersome. There may be limited storage space in the overhead bin since this is usually being used for emergency equipment only. 25 B None No Power Seat 25 B is an Economy Class seat in the last row of the plane and may have limited recline. The close proximity to the lavatories behind may be bothersome. There may be limited storage space in the overhead bin since this is usually being used for emergency equipment only. 25 C None No Power Seat 25 C is an Economy Class seat in the last row of the plane and may have limited recline. The close proximity to the lavatories behind may be bothersome. There may be limited storage space in the overhead bin since this is usually being used for emergency equipment only. 25 D None No Power Seat 25 D is an Economy Class seat in the last row of the plane and may have limited recline. The close proximity to the lavatories behind may be bothersome. There may be limited storage space in the overhead bin since this is usually being used for emergency equipment only. 25 E None No Power Seat 25 E is an Economy Class seat in the last row of the plane and may have limited recline. The close proximity to the lavatories behind may be bothersome. There may be limited storage space in the overhead bin since this is usually being used for emergency equipment only. 25 K None No Power Seat 25 K is an Economy Class seat in the last row of the plane and may have limited recline. The close proximity to the lavatories behind may be bothersome. There may be limited storage space in the overhead bin since this is usually being used for emergency equipment only. 3 A None No Power Seat 3 A is a standard Business Class seat, however, noise from the more crowded Economy cabin may be bothersome. 3 C None No Power Seat 3 C is a standard Business Class seat, however, noise from the more crowded Economy cabin may be bothersome. 3 D None No Power Seat 3 D is a standard Business Class seat, however, noise from the more crowded Economy cabin may be bothersome. 3 K None No Power Seat 3 K is a standard Business Class seat, however, noise from the more crowded Economy cabin may be bothersome. 7 A None No Power Seat 7 A is an Economy Class Bulkhead seat that may have limited legroom. There is no floor storage for this seat during takeoff and landing. The tray table is in the armrest, making the armrest immovable and slightly reducing seat width. 7 B None No Power Seat 7 B is an Economy Class Bulkhead seat that may have limited legroom. There is no floor storage for this seat during takeoff and landing. The tray table is in the armrest, making the armrest immovable and slightly reducing seat width. 7 C None No Power Seat 7 C is an Economy Class Bulkhead seat that may have limited legroom. There is no floor storage for this seat during takeoff and landing. The tray table is in the armrest, making the armrest immovable and slightly reducing seat width. 7 D None No Power Seat 7 D is an Economy Class Bulkhead seat that may have limited legroom. There is no floor storage for this seat during takeoff and landing. The tray table is in the armrest, making the armrest immovable and slightly reducing seat width. 7 E None No Power Seat 7 E is an Economy Class Bulkhead seat that may have limited legroom. There is no floor storage for this seat during takeoff and landing. The tray table is in the armrest, making the armrest immovable and slightly reducing seat width. 7 K None No Power Seat 7 K is an Economy Class Bulkhead seat that may have limited legroom. There is no floor storage for this seat during takeoff and landing. The tray table is in the armrest, making the armrest immovable and slightly reducing seat width. Each seat has a personal video screen, and you can enjoy between 5 and 8 audio channels. Every Business seat and every two out of three Economy seats are equipped with regular 110v AC power. 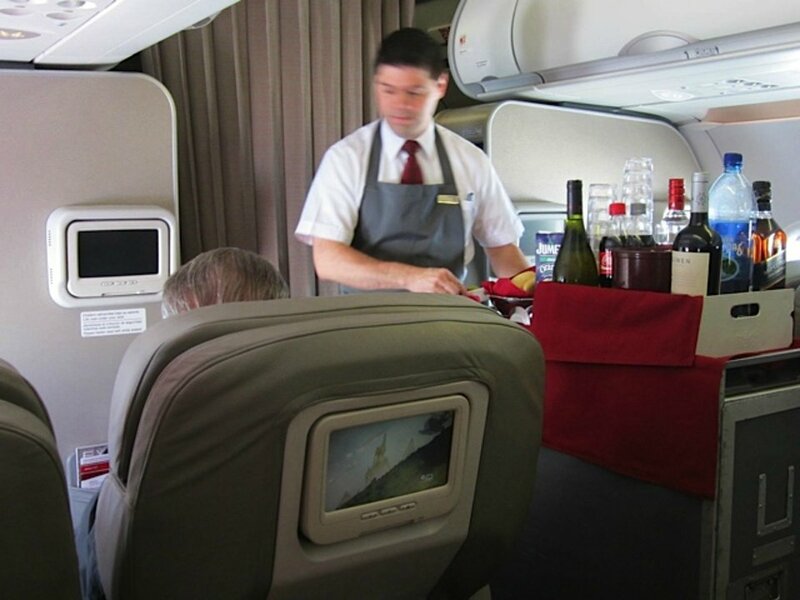 International flights from Colombia: All passengers are offered complimentary meal service. The A319 operates in a two-class configuration with 12 Business Class seats and 108 Economy Class seats. The A319 is used on various short- and medium-haul routes. TACA flies 1 versions of Airbus A319 (319).